Maria is guided by Danny at our House Reef! 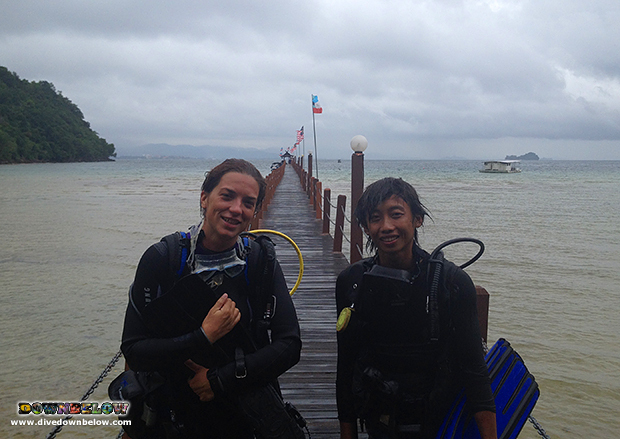 Home/Divemaster, IDC, News, Professional Diving Internships/Maria is guided by Danny at our House Reef! Prior to the mapping project of the PADI Divemaster course, local Go PRO internship candidate Danny conducts an orientation dive for our international Go PRO intern Maria’s familiarization of our dive training environment! Both candidates are currently completing the performance requirements of the first professional level of the PADI system of dive education to be qualified as PADI Divemasters. Danny, as all our local Go PRO interns, certifies as PADI Divemaster under our Downbelow-created 1-year ‘Work for a Career’ program and Maria will be developing her professional career further, by enrolling on our next PADI Instructor Development Course (IDC) starting in November to become a PADI Open Water Scuba Instructor! With more than a months’ time to familiarize with our training lagoon, we’re confident Maria will be successful on our Go PRO internship program! Resident Platinum PADI Course Director Richard Swann and our Go PRO team of PADI Instructor Trainers are passionate dive educators and will be following the two candidates’ progress throughout their dive training. For further information on our Go PRO internship programs and how our Go PRO team can offer their professional experience for you to Go PRO in Borneo, contact our Head Office! By Joanne Swann|2014-10-01T16:51:20+08:00October 10th, 2014|Divemaster, IDC, News, Professional Diving Internships|Comments Off on Maria is guided by Danny at our House Reef!